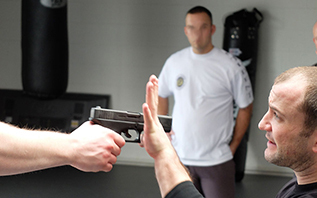 Krav Maga (meaning ‘close combat’ in Hebrew) is regarded by many to be the best self defence system around. We know Krav Maga works and it works under stress. 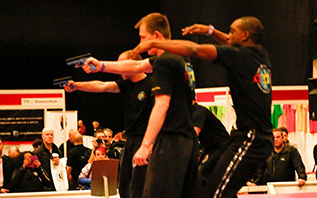 In general, Krav Maga’s techniques are practised because they have been proved to work in real-life situations. Many Krav Maga techniques focus on vulnerable parts of the body and therefore the system is is not practiced as a competitive martial art. 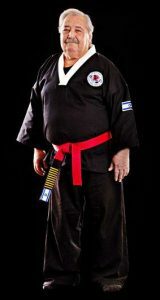 The Krav Maga Haim Zut Federation practices the original, traditional fighting style of Krav Maga as tought by founded by Grand-Master Haim Zut, a 10th Dan Practitioner and former student of Krav Maga’s founder Imi Lichtenfeld. The techniques used are similar to those used by the Israeli Defence Force and have been adopted by many law enforcement and protection services around the world. We practice defences against all manner of attacks and threats, including releases from dangerous grabs, chokes, strangles, headlocks and bear hugs. Students progress to defences against various stick/bat, gun and knife threats and also learn to practice dealing with multiple attackers. 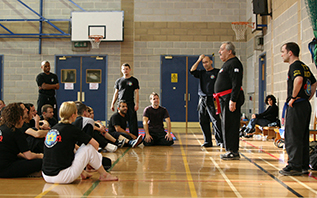 Our training techniques are developed from real-life experience and are under constant review by a professional committee who are dedicated to ensuring the highest quality when imparting skills that may one day be called upon to save your or someone else’s life, as well as promoting other aspects of life such as the values of being a good citizens before being good fighters. Students of all levels, from complete beginners to experienced practitioners are welcome to our open classes. No previous combative experience is required and there is no age limit. Classes are mixed and we actively encourage females to train with males to simulate real life attacks. Additionally most open classes are of mixed ability helping train for different types of attacker and allow for individual development based on mat experience rather than theory. Kids from ages 6 and up are also welcome to come and learn Krav Maga. Kids are taught self defence related activities such as shouting, kicking, running away and numerous games aimed at giving your child a confident start in the life. 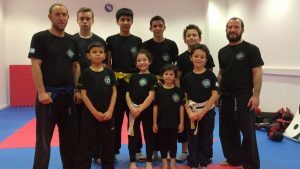 Classes become more disciplined as ages increase and youth classes (13+) will include a moderate amount of contact, sparring and focus on self defence techniques. All our instructors are certified by the Haim Zut Federation and Wingate Institute in Israel and hold clean UK Criminal Background Checks as required by law for us to work with your Children. We hold kids classes weekly in North London, see our timetable to the right.